For the past couple of days I’ve been here in Qatar, setting up the dig house for the 2017 season of the Origins of Doha and Qatar project. My husband, Daniel Eddisford, is the excavation director (while I’m the digital archaeologist) and we’ve been doing all the chores required such as picking up the rental SUVs, cleaning up the dig house and buying odds and ends for the arriving team. Our dig house is undeniably urbane as these things go–Dan & I wrote an article about the contemporary archaeology of dig houses that featured much less comfortable living quarters, including Flinders Petrie’s residence in a tomb in Egypt. Flinders Petrie in front of his tomb dwelling in Giza. Dig houses, as we say in our article, are good to think with–they are structuring structures that give shape to our thinking about the past. They also dictate critical social relations amongst team members so we try to give a lot of thought and care about our setup. Our dig house consists of two adjacent flats in “Education City” a sector in Doha that houses all of the universities. There are young families who live in the other apartments and we have a bit of grass, some palm trees, and open space. Yesterday Dan picked up several boxes of our kit that we’ve stored away for the year at UCL – Qatar. We have all sorts in there, spare lamps, kitchen knives, a christmas tree, a muffin tin, jigsaw puzzles and each team member has their own box of stuff that they’ve stored over the past year. It’s a tricky thing, storing stuff from year-to-year for excavation seasons. It’s a sign of confidence that 1) the project will continue without interruption and 2) you’ll be invited back. Even if you are very confident you’ll be back, it’s good to hedge your bets–we usually leave a random assortment of clothes that aren’t quite knackered…but close, along with various other odds and ends that aren’t worth transporting across the world, but we hate to throw away. Dan and I had stuff stashed on three different continents at one point. So this stuff, these little caches of assorted, slightly-knackered and mostly worthless kit become a bit nostalgic when you open them the next year. I’d forgotten about the hoody that I’m currently wearing. I bought it over a decade ago and I probably really should throw away but am currently thankful that I’ve left it as it’s chilly this week in Doha! This is a silly laundry basket that I bought for a long season in 2011 and am always happy to be reunited with. It’s also a point of pride, of anticipation of future work, to leave a box with your name on it. On the other hand, it can make people incredibly grumpy when they leave a box and then cannot retrieve the contents, even if they contain relatively worthless materials. When you do not plan on coming back, you often shed these same possessions, sometimes by burning or sometimes the project has a place to either donate or pass on clothing. Çatalhöyük had a giant box of miscellaneous ragged clothing that we’d rummage for costumes and such. Infamously, if you did not retrieve your washing from the clean washing pile you might find your beloved possessions in that same box. It’s an interesting class of possessions, slightly worthless, slightly precious, always a surprise when you rediscover it but nostalgic at the same time. In the desert there is a perfect proportion of dun sand and blue; a Rothko division between land and sky that horizontally bisects the lens. I can’t help but pop the colors on my photos of the desert, it is a magical saturation of yellow-orange and blue abused by movie directors into banality. Yellow! Blue! Yellow/Blue! By mid-March the colors are slowly bleeding into bright white, the desert is overexposed, blurring into shimmering haze. I arrived in Qatar during a rare, late series of thunderstorms that pelted perfect circles into the dust on our windshields. I delighted in the lightning and rolling thunder–I had missed weather–and the odd green dusting left on the desert by the uncommon wet. It rumpled up the landscape of Qatar, coaxing the small creatures out and painting new eddies and rivulets in the sand. I realized that I think of Qatar very much like I think of a crisply folded white piece of paper, sharp, unsparing, a bit clinical, the knife-crease of a freshly starched thawb. But everything is a bit sandier after the rain, and it was nice. The Origins of Doha project started excavations at Fuwairit this year, and I was excited to go back, after surveying the kilometer-long site in 2011. I wrote about the site then, and it’s funny to see that I discuss the same things–unusual rain, being at home in the desert. My role has shifted from excavation to handling digital media and outreach. I’ll be releasing several videos about the project shortly. After backfilling the trenches on the beach, we moved on to Oman, where Dan is doing his PhD work. Where Qatar is stark and bright, Oman is a piece of colorful velvet left out in the sun. Hot, hot, slightly faded on the surface, but full of plush depth and texture when you part it with your fingers. I’m not sure it is entirely productive to have a synesthetic approach to the feel of entire countries, but I guess it at least breaks up the great, homogenous other of Arabia. Where Qatar was archaeology on a beach next to a mangrove, in Oman we’ve been walking through the dry wadis, finding purplish squared rocks in lines in the ground perched on the sides. I fell in love with such a site last year on our grand tour of all things Bronze Age and otherwise oldish, but tried to stamp it out, as I thought there was little chance of us doing more there. But we went back there this year, and there are plans for more work, and I’m trying to keep it cool and detached when all I want is to dive in with with both hands. A feverish, adolescent oh-god-oh-god-should-I-text-him sort of anticipatory glee that is truly improper when it comes to scatterings of 4,000 year old pottery in the desert. I guess I’d be more of a scientist if I didn’t have such a great love for this stuff. I’ll be back in England next week, where the creep of spring doesn’t come in bold swashes of Hollywood color, but pushes small flowers into the air; the leaden gray skies breaking up into miscellaneous and slightly whimsical feather-clouds. In the meantime, I’m trying to wrap the desert around me, keep it close, an immaculate yellow/blue geometry cross-cutting my mind. 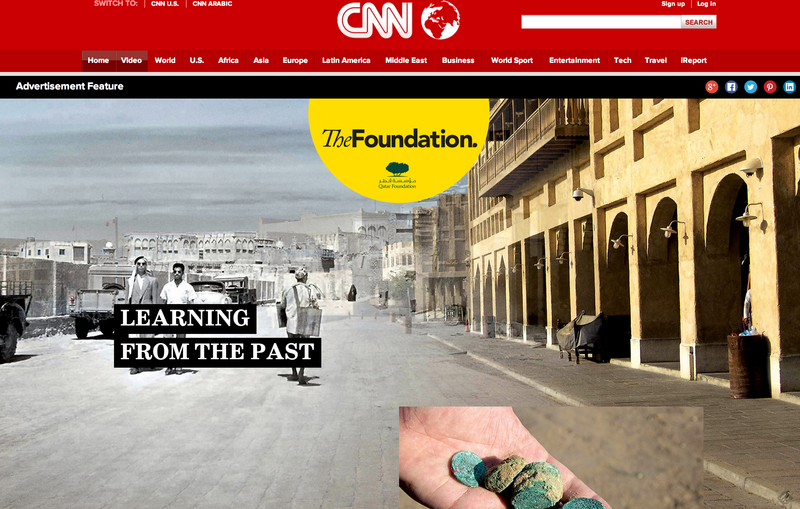 I was happy to see that a mash-up that did a while ago for the Origins of Doha project was featured on the special Qatar Foundation section of CNN. The photo is near the Souq Waqif, and we located and re-shot the photograph using one of the few landmarks left in that area, a small minaret visible above and to the left of the men walking toward the camera. The black and white photograph comes from the Bibby and Glob expedition to Doha. 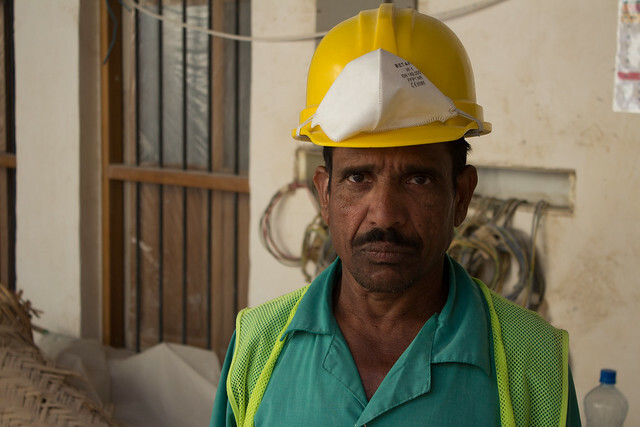 You can see the full feature about the Origins of Doha Project, as linked from the project webpage HERE, and includes the print versions of the article in Arabic and English. …and then there are the days that you spend with your head down a toilet. 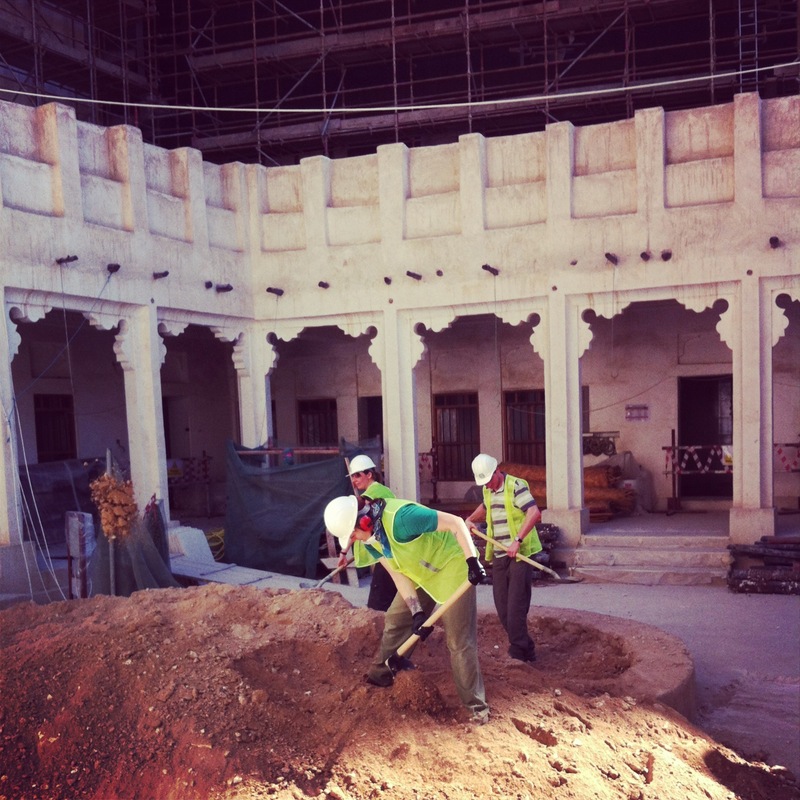 Digging in the center of a “Heritage House” in Doha. 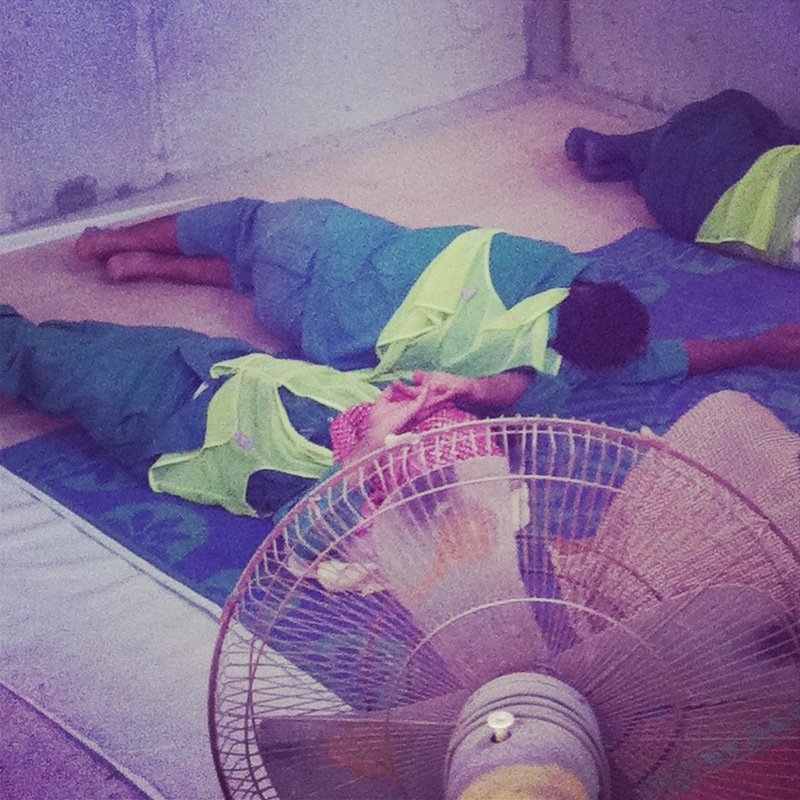 We got the call and three days later, we were on a plane back to Doha. 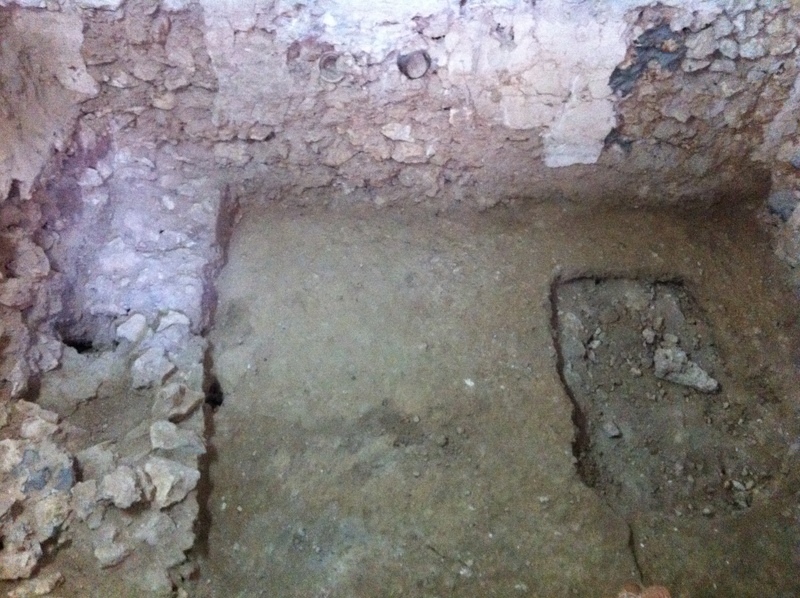 So we’re back digging in Old Doha, finding remains of an older house beneath a “Heritage House” that has been preserved in the middle of an enormous construction site. Every trench that we’ve opened has revealed either architecture or evidence of occupation, so we have a lot to work on in the next couple of weeks. There’s been a lot of “beasting”–moving lots of dirt in a rapid fashion. As most of it was construction infill, there weren’t a lot of photos or levels taken, just a lot of pick-axe and shovel handling. Exactly what I needed after being so well fed in England! Yesterday I beasted out the rest of the construction fill from a small 4m x 3m room and so today I was rewarded with digging some archaeology, which meant a massive slow-down in pace and a lot of paperwork. I have to climb a ladder to get in and out of the trench, as the room I am digging in is about 2m below the threshold now. The whole room has been heavily invaded by the later structure and there is huge concrete, stone, and industrial epoxy mess on the east side of the trench that I try not to look at too often. It’s horrible and I don’t plan on chunking it out as it underpins the building. ugh. Sorry about the terrible photo–I only had a single halogen light way up on the wall. But I have a couple of walls surviving and there was cut in the western bit of the room to poke at as well. It was sealed off with concrete, so I hacked away at it and found that it was filled with rocks. Lovely. About 30 cm down (.30m for nerds) there was a layer of concrete that had been smeared on to some other rocks–you could still see the finger impressions. There was a hole in the middle and that is when I realized that yes, I was digging out a toilet. 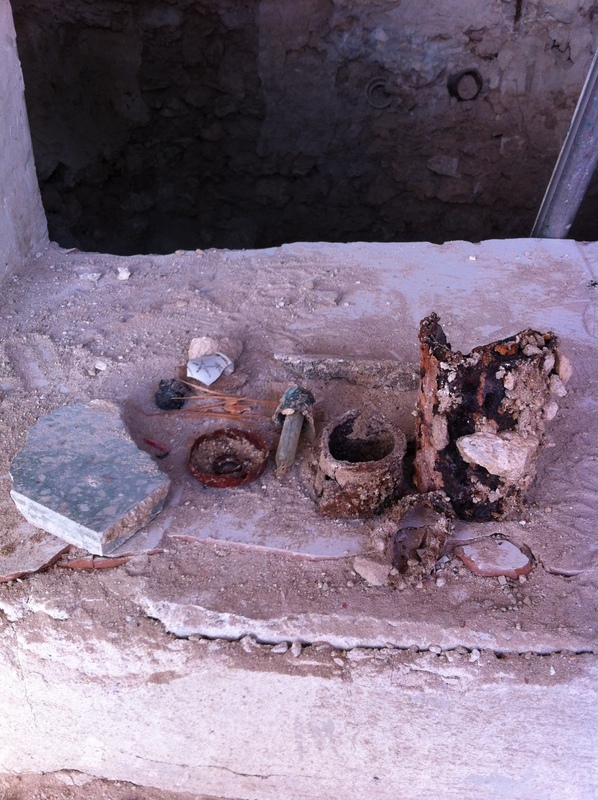 The first 20 cm of the fill had a bunch of broken tile, probably the remains of the fitting out of the bathroom. Then…yep. Yellowish-brown silty stuff. Happily I was wearing gloves. I got about a meter into the fill then stopped, as it was too deep to dig safely. As it was, I was balancing myself on my hands awkwardly in a small rectangular cut–good thing I’ve been practicing my handstands. 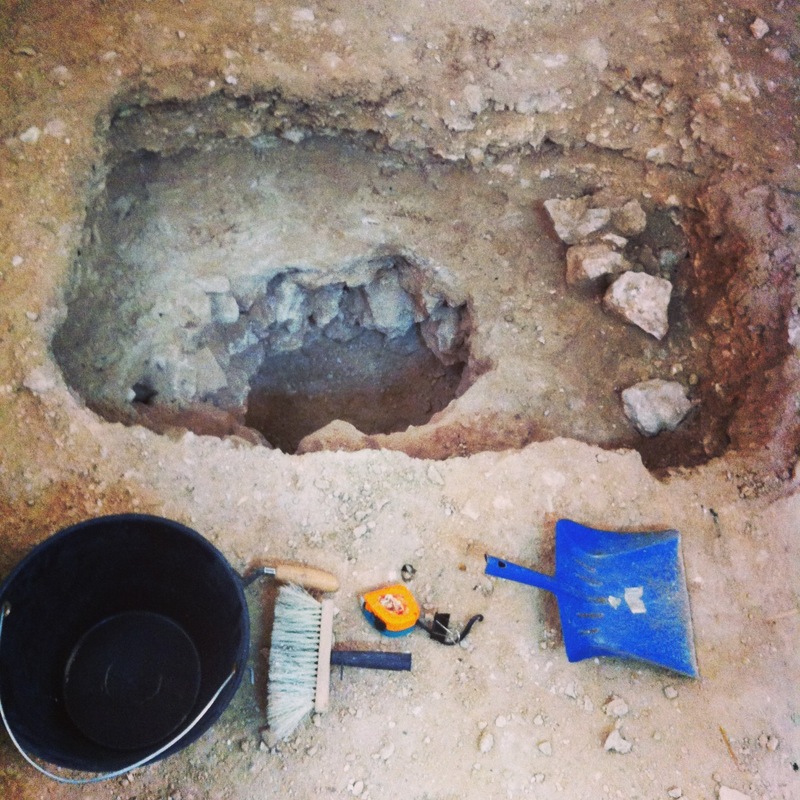 I finished digging the toilet (hamam) and saved all the fill for our lovely paleobotanist, Mary Anne Murray. So now I have to finish that pesky application to the R1 University. Happy digging, y’all! The things you find down a 60 year-old toilet in Doha. 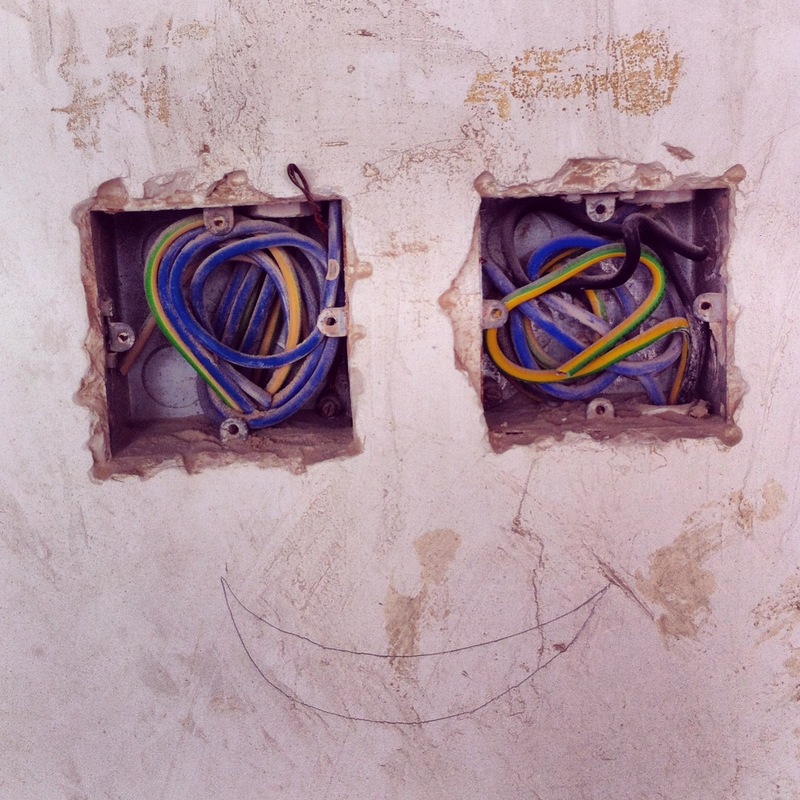 Author colleenmorganPosted on February 13, 2013 Categories Archaeology, field workTags Archaeology, doha, fieldwork, qatar4 Comments on …and then there are the days that you spend with your head down a toilet.